A large, stylish pub located next to London Road station, The Open House features three separate inside areas, plus an upstairs function room – not to mention one of the largest and most attractive beer gardens in Brighton. 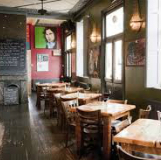 The food, served every day, is a particular highlight and while the pub is child-friendly during the day, they have occasional DJs, live music and improvisational comedy. Locally produced artwork from the likes of the Fiveways Artists group adorns the downstairs walls, while the function area, known as the Play Room, plays host to a variety of visual and performance arts and is also available for private hire.